Two iconic cigar makers clash in a battle of titans: Nestor Placencia versus Manuel “Manolo” Quesada, distinguished gentlemen of the leaf. Their choice of weapon: Nicaraguan tobacco from the Jalapa Valley. That’s how it was supposed to be. But then I learned that the wrapper used by Quesada for his Jalapa blend is in fact from one of Plasencia’s farms. So instead of a cataclysmic battle of the ages we have some kind of royal intermarriage. I guess I’ll have to leave the battling tobaqueros to the ads in the cigar catalogs. But I still can’t resist comparing the Quesada Jalapa to the Plasencia-driven Montecristo Espada. Both employ Jalapa tobacco to great advantage. Does one do it better? The Quesada Jalapa has its roots in a cigar I’ve only read about: the Quesada Selección España. It was designed for the Spanish market exclusively, but when American cigar heavyweights had an opportunity to try it at the ProCigar festival in 2011, they reportedly went bananas over it. The problem is that Quesada could not increase production of the Selección España because the wrapper, an Ecuadorian Arapiraca, is rare and in short supply. So he went looking for an alternative to the Arapiraca. He found it in Jalapa. In one of Nestor Plasencia’s barns. Plasencia had produced the wrapper in 2002 as an experiment, and he had a few hundred bales just waiting around for Quesada to discover. The Belicoso is a stately looking cigar, solid with a soft claro wrapper through which the texture of the binder shows. The tip is rolled well, though I have had a few of these split at the head after spending a few months in 70% humidity. The draw is good to excellent. The cigar burns slowly and evenly. 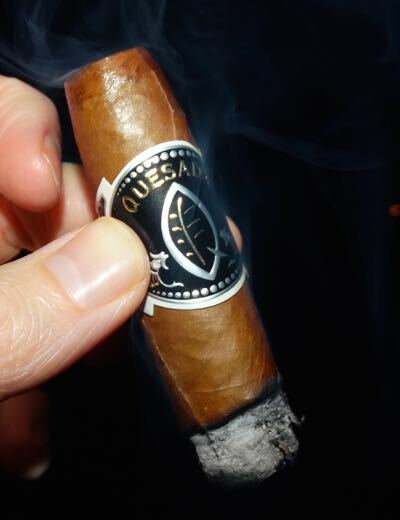 The Quesada Jalapa is a creamy and aromatic cigar with just a touch of pepper on the finish. The base flavor is earthy — even mushroomy at times — with an occasional whiff of sulfur. The earthy flavor turns musky in due course, complemented by a woody aroma with some floral notes. The smoke texture is full, creamy, and well balanced. The cigar picks up an extra shake of black pepper in the last lap, but aside from this there are no dramatic transitions. Consistent, tasty, and moderately complex. The Espada is Montecristo’s first Nicaraguan puro, blended by Nestor Placencia in concert with Altadis’s “Grupo de Maestros.” The name of the cigar is a tribute to the Montecristo insignia depicting crossed swords in a triangular pattern — espada is the Spanish word for sword. The Espada is made with the craftsmanship expected of a Montecristo — an attractive golden brown wrapper, a perfectly executed flat cap, a solid roll and a draw with just the right amount of resistance. The Espada Guard is similar in one respect to the Quesada Jalapa: the smoke texture is rich and creamy. But the Espada is spicier, and it packs a bigger punch. Black pepper blends with oak on the nose and earth on the palate. The smoke is smooth and refined, but more assertive than the Quesada. As the Guard burns to the finish the flavors intensify but don’t transition too much. The cigar is refined, well balanced and expressive, but not tremendously complex. Montecristo’s Jalapa entry is everything I expect from a Montecristo — it’s a sophisticated and classy smoke, but predictable. Predictably good, but not as adventurous or unique as I’d hoped. Quesada’s Jalapa is a bit milder than the Espada, but it makes up for this with complexity. 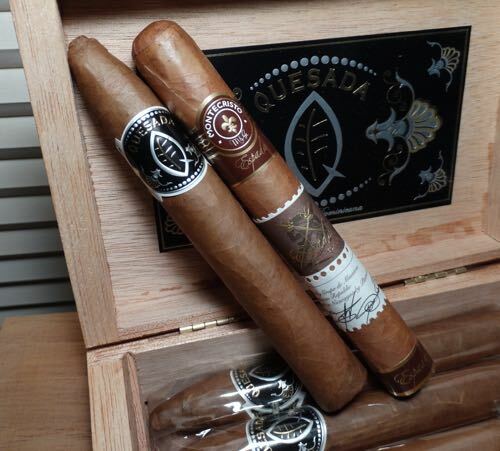 The Quesada is also a little less expensive, coming in at around $8 USD to the Montecristo’s $11. Both are excellent cigars, but in my opinion the complexity of Quesada’s Jalapa trumps the refinement of Placencia’s Montecristo. But since the wrapper leaf on the Quesada bears the stamp of Placencia, I have to say that both cigar makers come out on top. Great comparison review. I’ve had and enjoyed the Quesada, but not the Montecristo. I would have to say that the nearly 30% difference in price would have an impact on my assessment as well. Love seeing the return of the snowflakes! I hope you had a great Thanksgiving. Thanks, Jeff. Have yourself a smokin’ little Christmas. I’m hoping Santa brings me a few goodies from the Cigar Federation.